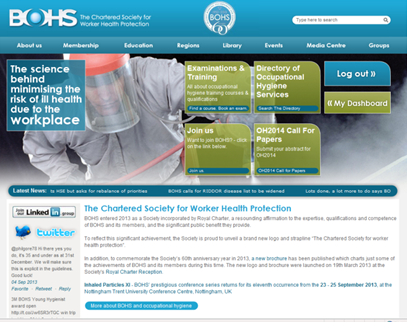 OHSI is pleased to announce that we have agreed an arrangement with our 'sister' society in the UK, the British Occupational Hygiene Society (BOHS). For an additional fee of �50 you can extend your OHSI membership to include 'BOHS International Partner'. On-line searchable access to the full text of the current edition of the prestigious international journal ‘The Annals of Occupational Hygiene’. On-line access to the back catalogue of The Annals. Member-only access to the exciting new BOHS website. Access to regular BOHS Exposure Magazine and e-bulletins via the website. Be resident in Ireland or of Irish nationality and resident abroad. Simply choose the 'BOHS International Partner Membership' option when you renew your OHSI membership on our website and pay the additional �50 fee at the same time as your normal OHSI membership renewal. New members should select the 'BOHS International Partner Membership' option on the membership form. We will pass your details to BOHS who will provide you with your access details to their website and the Oxford Journals Annals website.